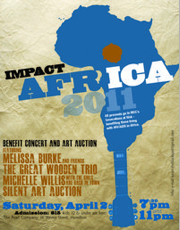 Make the trek to Hamilton on Saturday, April 2, 2011 for the Impact Africa Benefit Concert & Silent Art Auction. 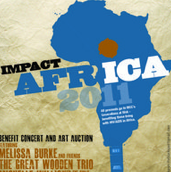 All proceeds go to Mennonite Central Committee’s Generations at Risk, benefiting those living with HIV/AIDS in Africa. Art for auction by 14 local artists! Cake and drinks available by donation.